We have two games for you both following this week's theme of superheroes. Let's get to the games. 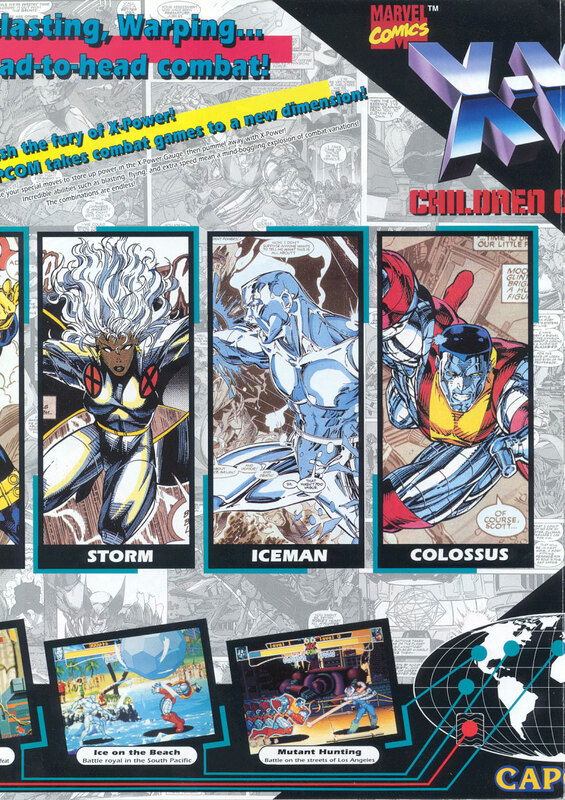 Our first game is X-men - Children of the Atom. 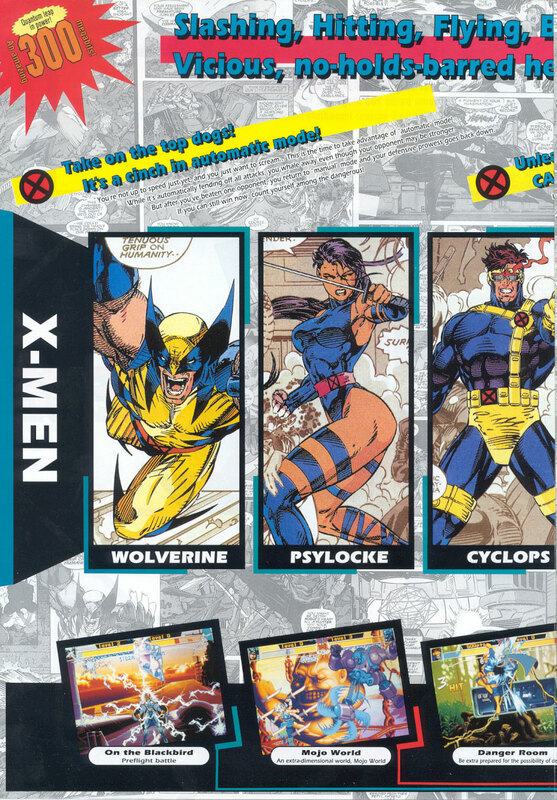 X-men - Children of the Atom was brought to us by Capcom and was released in the year of 1994. 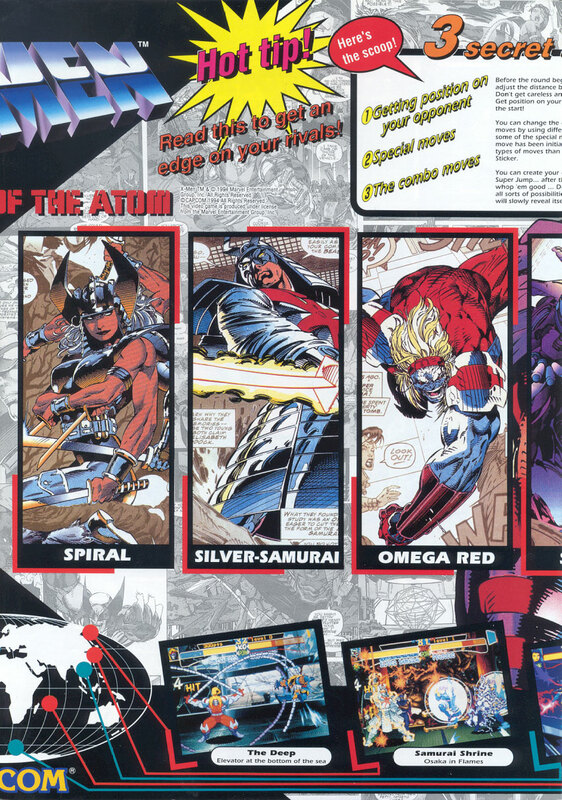 X-men - Children of the Atom is a versus-fighter and is the first game where Capcom used characters from the Marvel Universe. 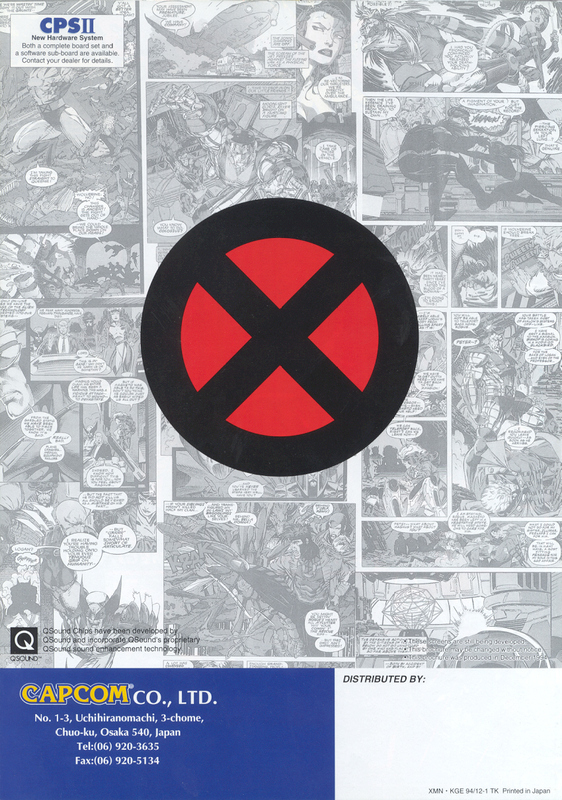 By using colorful animation and voice actors from the X-Men animated series making the game was highly praised for capturing the spirit found in the comics of the same name. There is ten playable characters plus two secret characters. 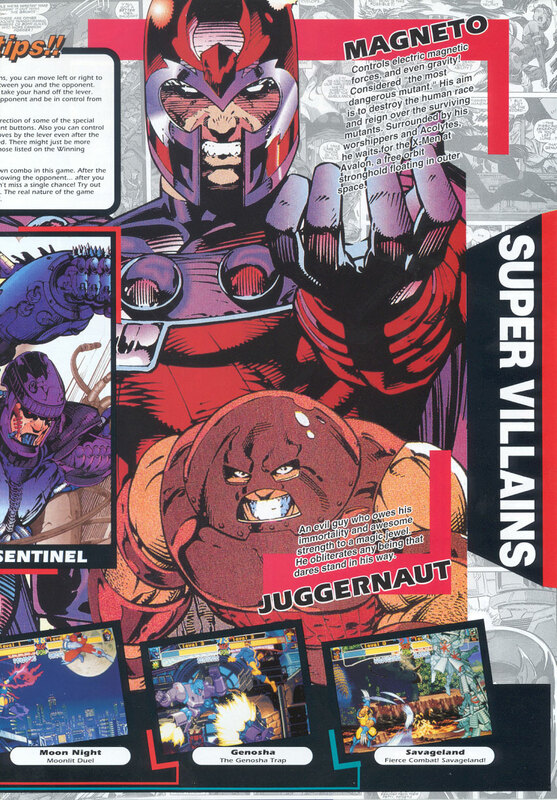 Out of playable characters six are X-men and four are Villains. 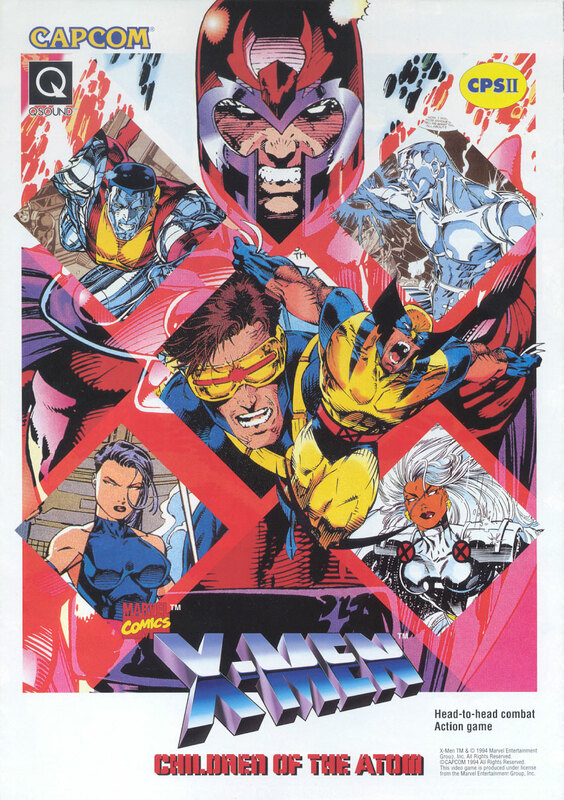 The X-men you can choose from are Colossus, Cyclops, Iceman, Psylocke, Storm, Wolverine and the Villains are Omega Red, Sentinel, Silver Samurai and Spiral. The two secret playable characters are Akumba and Juggernaut. 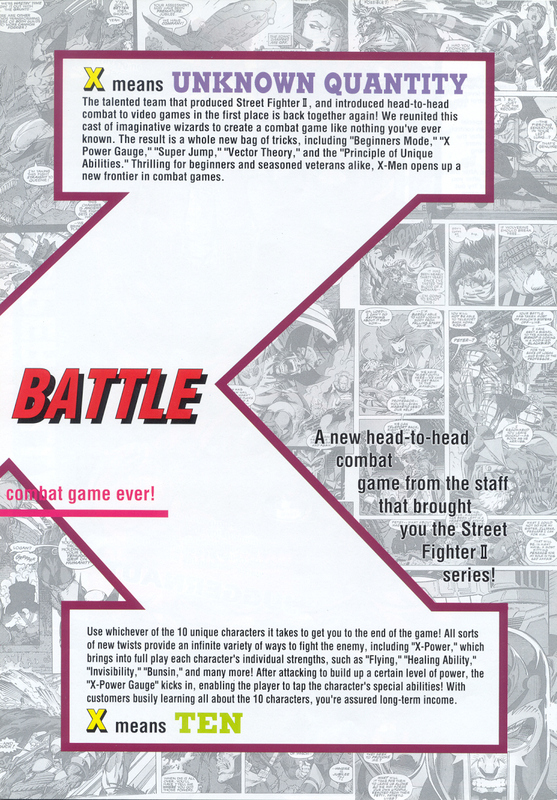 Akuma and is very similar to his Super Street Fighter II Turbo appearance. The code for Akuma on the character select screen highlight Spiral and wait 3 seconds, then move without stopping through : Silver Samurai, Psylocke, Colossus, Iceman, Colossus, Cyclops, Wolverine, Omega Red and stop on Silver Samurai. Wait 3 seconds there and press and hold: LK+HP+HK. To play as Juggernaut input Akuma code, then after the battle press Up/Left TWICE and you should see Juggernaut's face. After picking your character you are able to choose between manual or automatic modes. These modes are for blocking, choosing automatic will make some features not available during your play session. The single player consists of eight stages six of which are from the character select screen. The other two stages are boss battles the first one is against Juggernaut and the second one is against Magneto. It is also not possible to fight a clone of yourself during single player mode. Akuma is possible to fight in the single player mode after the sixth match by complete a set of hard tasks. To fight against Akuma you must use 'manual block' and win every match without continuing, defeat your opponents two rounds in a row, having first attack on each round. You must also win the final round of each battle with your Hyper-X move. You have an X-Power gauge which is similar to the Super Combo gauge Super Street Fighter II Turbo. The gauge starts at level one and becomes level two at the half-full mark, to build this gauge you performing normal and special attacks. The X-Power is used to perform X-Ability and Hyper-X moves, breaking your fall or performing counter-throws will also consume a portion of your X-Power gauge. 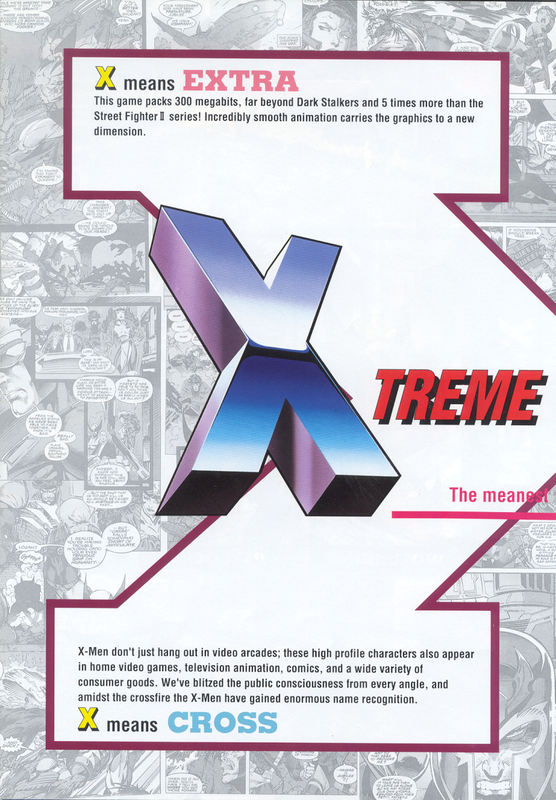 X-men - Childern of the Atom introduced new things to the versus-fighter some of which are rolling after falling, super Jumps, aiming of projectile move and more. Our second game is Superman. 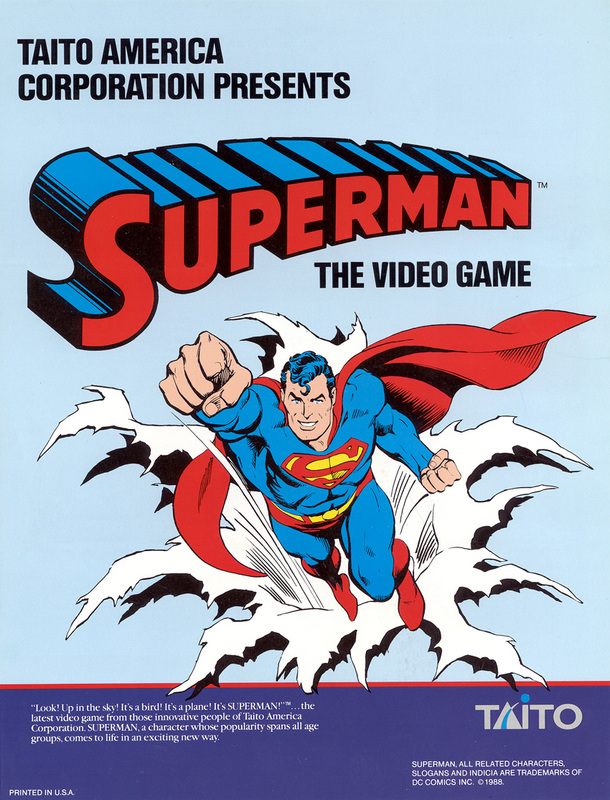 Superman was released in 1988 and developed but Taito. 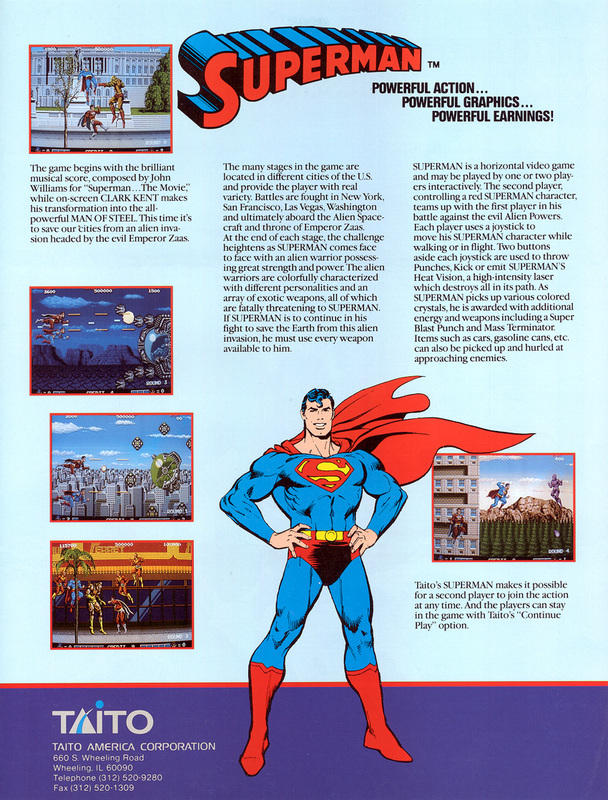 Superman is a 2D scrolling fighter in which you control Superman trying to stop an alian invasion by Emperor Zaas. Player two plays as a red Superman which is not explain during the game. A red Superman appears in an imaginary scenario in Superman (vol. 1) #162 which might be who player two is playing as. The game has five levels which are Metropolis, San Francisco, Las Vegas, Washington D.C and Alian Spacecraft. The first four levels consists three stages a side-scrolling fighter then a vertical scrolling flying fighter and a side-scrolling shooter. Each stage also has a boss at the end. The fifth level has five stages starting with a side-scrolling shooter and an extra boss fight at the end. You have four different attacks to beat back the evil minions. They are a punch, a kick and a sonic attack charged by holding the punch button. The forth attack is only during the side-scrolling shooter stages and it is Superman's heat vision attack. In the first stage you also find creates and barrels which you can be thrown to kill enemies. When you break creates and barrels they may contain crystals. There are three types of crystals which can restore energy, perform sonic attack without charging and killing all enemies on the screen. That’s all we have for this week I hope you enjoyed the games.